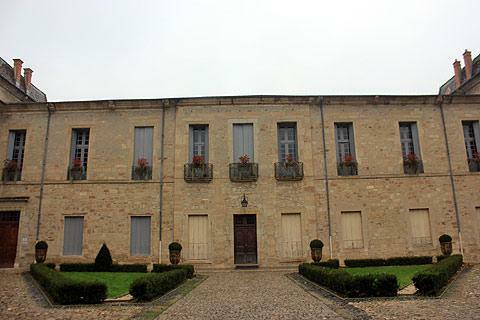 Lodeve is a small town in the Herault department of Languedoc-Roussillon region, to the north of Pezenas. 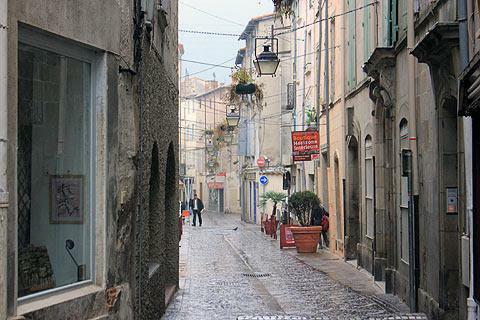 The town is in an attractive valley, formed at the confluence of the two rivers, the River Lergue and River Soulondre, and was once a stopping point on the pilgrim paths that pass across southern France en route for Santiago de Compostella. 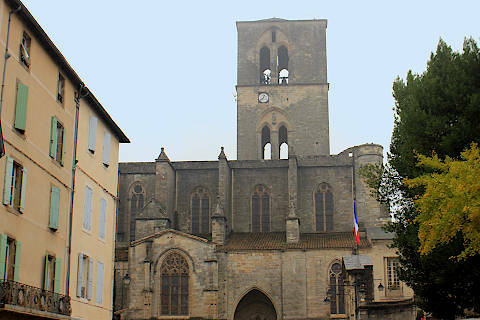 The most important site in Lodeve is the Saint-Fulcran cathedral which dominates the centre of the town. Dating from the 13th century, the gothic style fortified cathedral was built on the site of earlier cathedrals that are thought to have stood here since the 5th century (although little remains of these earlier cathedrals you can see some of the capital stones in the local museum). Of particular note at the cathedral are the carving around the doorway, the belltower, the cloisters and the stained glass around the choir section. 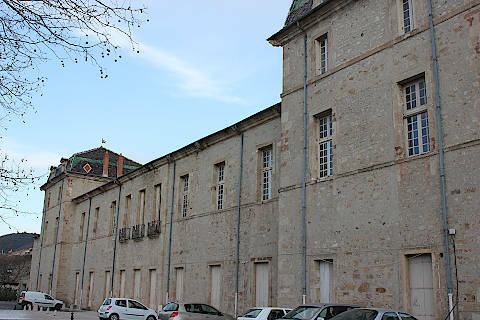 Next to the cathedral you can see the large Bishop's Palace with its cobbled courtyard, Louis XV staircase and reception rooms decorated in Empire and Italian styles. Other sites of note in Lodeve include a tower, 15 metres high, that was part of the original fortified ramparts of Lodeve, and the monument to the dead by local sculptor Paul Dardé: this is a very noteworthy sculpture, with a family and friends surrounding the body of a dead soldier. 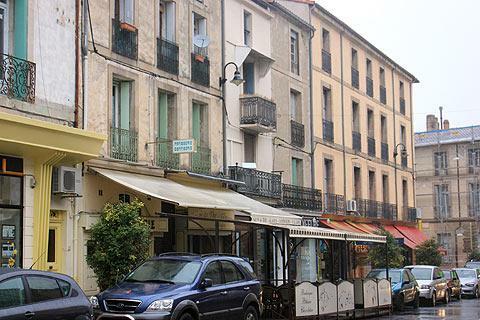 You will also want to amble through the pleasant pedestrianised centre of the town, to see the town hall and other impressive 18th century town houses, and to walk a little alongside the Lergue river, with the pretty backdrop of wooded hillsides. The Fleury Museum contains an extensive local collection of geological and prehistoric remnants, and some local fine arts. 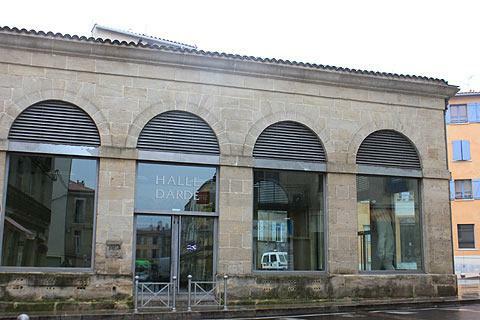 The Dardé hall, a 19th century hall now dedicated to the sculptor Paul Dardé, contains three of his sculptures (one is a copy of the original). Saturday morning is market day in Lodeve. There are several interesting and attractive natural sites in the hills around the town - indeed, it is usually visitors to the surrounding countryside that find themselves visiting Lodeve. Among the most impressive be sure to visit the Cirque de Moureze and the scenic leisure activities around Salagou Lake. 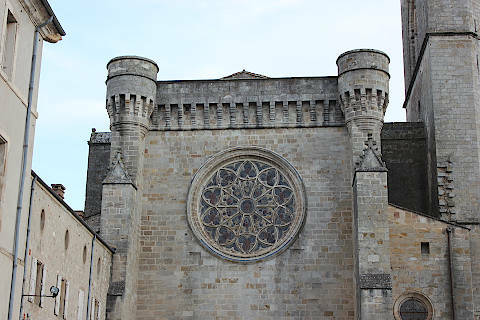 The 17th century Italianate style Church of Notre-Dame at Gignac also merits a visit, as do the castle and historical centre of Clermont l'Herault.